Called the "Western Vanderbilt" the initial Ira Cobe Trophy Race was run on a 23.27-mile road course completing a circuit between Crown Point and Lowell Indiana on June 19, 1909. It was commissioned by Ira Cobe, who founded the Chicago Automobile Club. Low attendance and the brutal punishment inflicted by the under-developed roadways contributed to the decision to move the contest for this classic trophy to the Indianapolis Motor Speedway in 1910. This content was originally published in the June 19, 1909 edition of the The Lake County Times in the Chicago area. The articles provide terrific coverage of the Ira Cobe Trophy. Dubbed the "Vanderbilt of the West" by the press, the trophy was commissioned by Ira M. Cobe, president of Chicago Automobile Association. The article in attachment IMSCobe103109 was published in the Indianapolis Star on October 31, 1909. It discussed the likelihood that the Ira Cobe Trophy Race would be conducted at the Indianapolis Motor Speedway in 1910. 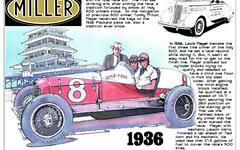 The event, the first major auto race organized in Indiana, originally ran in Crown Point, Indiana in June 1909. This is terrific coverage of the Ira Cobe Trophy from June 19, 1909. Dubbed the "Vanderbilt of the West" by the press, the trophy was commissioned by Ira M. Cobe, president of Chicago Automobile Association. The American Automobile Association (AAA) was founded in Chicago in 1902. Like many early American road races, this event was more akin to an off-road contest by today's standards. The pace of change in automotive technology between the turn of the 20th Century and 1908 was pronounced and developments within motorsports reflected it. There were a handful of auto races in the United States in 1900 - inevitably involving at most a total of three or four cars of one or two cylinders. After a build-up of months the Indiana Trophy - the support race to the Cobe Trophy - was staged June 18, 1909. At long last Indiana and the mid-west United States had a major auto race. The much anticipated Cobe Trophy was months in the making and the Indianapolis newspapers reflected the enthusiasm of the age for all things automobile oriented. This brief item from the May 20, 1909 Indianapolis Star explains why Nordyke & Marmon of Indianapolis elected not to enter the Cobe Trophy or Indiana Trophy, the first major races held in Indiana in June 1909. This article was originally published in the August 15, 1909 Indianapolis Star and concerned the Cobe Trophy race that had been ran weeks earlier in June with Louis Chevrolet winning. While it was a financial failure on a course that was later deemed inadequate it was and is historically significant as the first major race conducted in Indiana. In fact this was the first major auto race staged west of the eastern seaboard. Originally published in the August 29, 1909 Indianapolis Star this article provides rare insight to an early race driver's thoughts about strategy in winning races. The driver is Indiana Trophy winner Joe Matson who drove a Chalmers-Detroit to victory in the preliminary event to the Cobe Trophy.